Carl Nolte, third from right, celebrates his 80th with friends at John’s Grill with Mike Taylor, Steve Rubenstein, Lee Houskeeper, John Konstin and Allen Matthews. Photo courtesy John’s Grill 2013. 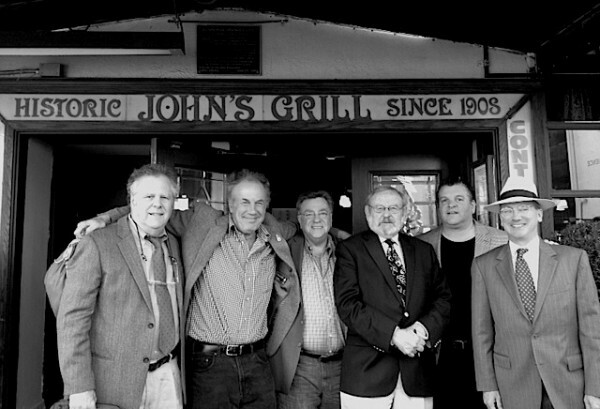 Carl Nolte (third from right), former Pacific Media Workers Guild president, celebrated his 80th birthday Wednesday at San Francisco’s John’s Grill with fellow Chronicle veterans and friends. From left, Mike Taylor, Steve Rubenstein, Lee Houskeeper, Nolte, John Konstin and Allen Matthews. Chronicle editor Jerry Roberts sent this top ten list of stories Nolte covered in his Chronicle career.